Neurons are comprised of two functionally and morphologically distinct cellular compartments, the signal-sending axon and the signal-receiving dendrites. The different functions that these compartments carry out require different complements of proteins. A major question is how each compartment is supplied with the unique set of proteins that are necessary to send or receive signals. One way the neuron achieves this is through microtubule-based transport. The basic components of microtubule-based transport are the molecular motors dynein and kinesin, and the microtubule building blocks, alpha- and beta-tubulin. Molecular motors are mechanochemical enzymes that "walk" along microtubules to deliver cargo throughout neurons as well as many other cell types. This microtubule – motor interaction is at the heart of cargo delivery, yet the mechanisms determining how motors deliver their cargo remain unclear. The Wildonger Lab investigates basic mechanisms of microtubule-based transport that are essential to the delivery of compartment-specific proteins that are critical to proper neuronal communication. Sensory neuron imaged in a live Drosophila larvae. The dendrites (shown in white) are large, branched structures emanating from the cell body and their function is to sample and receive cues from the environment and neighboring cells. 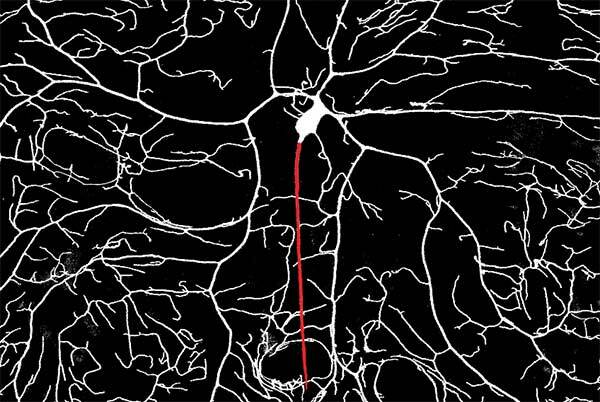 The axon (shown in red) transmits the information gathered by the dendrites and relays it to neighboring cells. One project in the Wildonger Lab focuses on how microtubule composition and post-translational modifications affect microtubule stability and transport. Many organisms express several isotypes of alpha- and beta-tubulin, thus creating a heterogeneous population of microtubules composed of many varieties of tubulin. Moreover, tubulin can be post-translationally modified (PTM) on several residues to influence transport. Microtubules can also be decorated by numerous microtubule associated proteins (MAPs). Combined, tubulin isotypes, PTMs and MAPs are thought to act as ‘sign posts’ for directing microtubule-based traffic. Ongoing studies in the Wildonger lab are investigating how various tubulin isotypes, associated proteins and post-translational modifications influence the microtubule – motor interaction to ensure the accurate and precise delivery of cargo that is essential to neuronal function. The power of Drosophila genetics combined with live-cell imaging enables us to study fundamental biological questions about intracellular transport and the effects of mutated proteins in real-time and in the protein’s natural environment. Furthermore, since many of the proteins involved in transport are conserved from flies to humans, we can use Drosophila to model the effects of mutant proteins associated with transport deficits in human diseases. Understanding how microtubules influence transport will provide a foundation for investigating a fundamental question of how neuronal function is created and maintained. Developing fruit fly larvae expressing a fluorescently-labeled membrane protein in a subset of sensory neurons. These neurons tile the body wall and enable the animal to sense its environment. Due to their location just underneath the animal’s transparent cuticle, these neurons are easily imaged using confocal microscopy. This advantage allows us to visualize the effects of mutations in components of microtubule-based transport in living animals.